Still deep in winter, the Willamette Valley had spring on its mind today. On my ride this morning I watched a redtail hawk fight a stiff headwind while hauling a substantial addition to its distant nest in its beak. Dusky Canada geese rode the southeast winds to the north, forming and reforming their trademark V patterns high overhead. Llamas haughtily watched me pedal by from their corrals and flocks of wooly sheep on green sloping hills fussed over their gaily tromping black and white newborn lambs. In the blueberry fields of Breyman Farms near Independence farmworkers spiffed up the strikingly red bushes that bear the fruit. 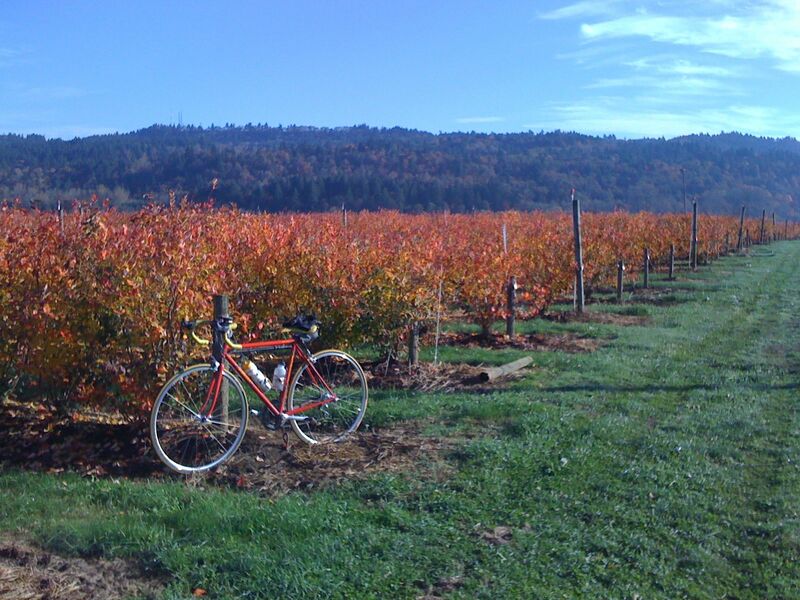 Last fall I snapped a photo of my Torelli “after” the harvest but pre-pruning. Today I took a “before” photo near the same spot. Obviously, based on my scant evidence, the antioxidant-rich fruit needs a fair amount of TLC handiwork before it gets to market. Further on my ride along Riverside Road the folks at Ankeny Vineyards had prepped most of the hillside’s vines for this year’s vintage. Ankeny, which makes some tasty pinot noirs, is also one of the few wineries in the country that produces Maréchal Foch grapes and wines. I continued around Ankeny National Wildlife Refuge, as I often do. Today its fields, ponds, woods, and roadside bramble were alive with wild doves, Steller’s jays, redwing blackbirds, more hawks, a Spotted Towee or two, and many other birds I did not recognize. As I climbed up Liberty Road at one point off to my left I could see Polk County and the coastal mountains in the distance being kissed by the leading edge of a Pacific storm heading our way. If I looked to my right I saw the sun light up the snow and glaciers on Mt. Jefferson looming 3,199m (10,497 feet) above a fifty mile stretch of the Cascade Mountains. Winter may rule the calendar, but for today, at least, spring held sway. Official bikeways are not very useful to locals, who seldom ride them as designed. Indeed, bikeways are a collection of segments of many excellent local riding experiences. Bikeways are not for the local bicyclists; they are of them. 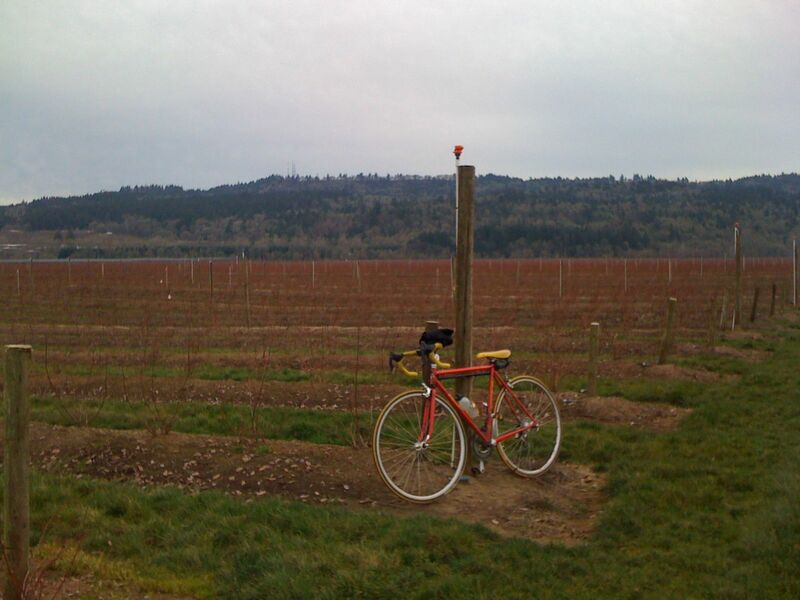 For years I have ridden various parts of the newly christened Willamette Valley Bikeway. I fully appreciate its intent. 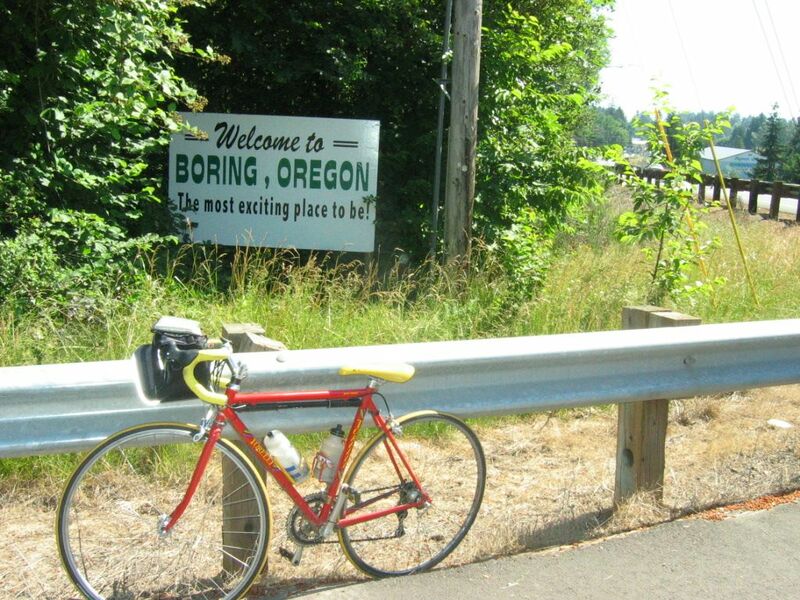 But as a local rider, I seldom plan my rides along its lovely route, (artfully captured by photographers at the Oregonian). That’s because there are even better roads to ride in the area. The WVB only makes sense to someone who doesn’t understand the local terrain. Anyone familiar with the area would suggest alternative roads at almost every stretch of the 132-mile designated run from south of Portland to Eugene. As with almost anything prescribed, blessed, authorized, sanctioned, approved, stamped, and sealed by the appropriate officials, it’s half right. The trick is to know which half. Don’t get me wrong, the WVB is an ideal way to get from Place A (Champoeg Park–pronounced sham’poo’ee, by the way) in the northern Willamette Valley to Place B (Armitage Park) in the south valley. However, locals generally aren’t taking that precise ride, except as part of a club or group event, a rare occurrence for most of us. This is true whether it’s the WVB or the 100-mile Minuteman Bikeway in Massachusetts or the Wisconsin Bikeway between Milwaukee and LaCrosse. That is, locals generally don’t use the defined route as its planners’ envision it. In fact, to a local, bikeways of any sort are merely parts of different routes altogether. If anything, a bikeway is a launchpad for local riders’ different personal routes, ones way better than the bikeway itself. These different, personal routes are the ones we create for ourselves. The short ride-before-dinner hill climb. The camel and zebra ride. Then there are the B-flat rides, as my riding partner Mike Nord says of the standards we pedal together: the two-ferry (Buena Vista and Wheatland), the Ankeny, the Cascade Highway or Victor Point, and Summit Loop rides come to mind. Most of our local 30-60 mile treks touch on one part of the WVB or another. But they are far more diverse and interesting by diverting away from it. After all, how many zebras and camels populate the countryside along the WVB?